NIMBY, Not In My BackYard, is the predictable psychological resistance to changing pretty much anything. NIMBY resistance to change is often a MEDICAL Issue - a Chemical/Hormonal REACTION due to our unintended provocation. What if a Presentation Device, with a myriad of inputs and outputs, capable of videos, PDF display, drawings, video conferencing, spreadsheets, and anything else—could also allow a participative experience that helps overcome reluctance and resistance to change or to ideas? 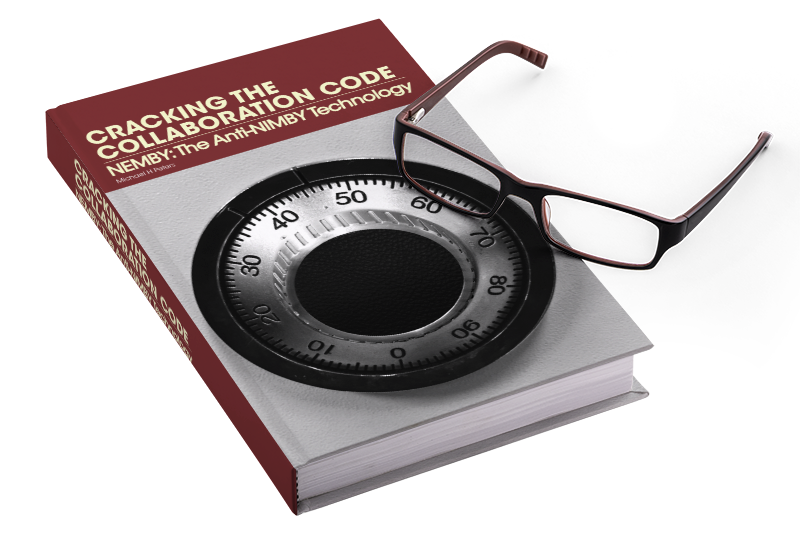 Cracking the Collaboration Code is your encryption key to “escape velocity” and fostering collaboration with stakeholders in development and relationships. Using this Book, you can put together a plan for the most effective meeting strategy to get the best results for your business and relationships. What do negotiations and charrettes have in common with investor, community, and government meetings, as well as with interpersonal and coworker relationships, marriage and childrearing? There “Our logical minds are often entirely blocked by our emotions.”SOLUTIONS! Everything is always about people. there existed a video-conferencing device that made virtual meetings just as engaging and feedback rich as in-person settings?